Sterling Silver Chandelier Earrings from Mexico, "Empress"
This beautiful design by Gianluca Anzani recalls Mexico's colonial art. 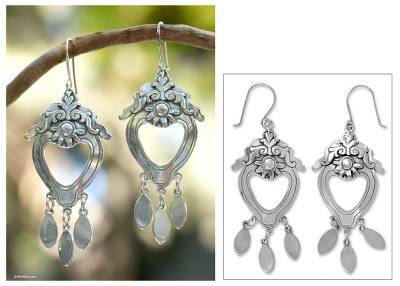 Fashioned of silver, the floral earrings culminate in three dancing pendants. He crafts the pair by hand with a rustic technique, thus the size could vary slightly.